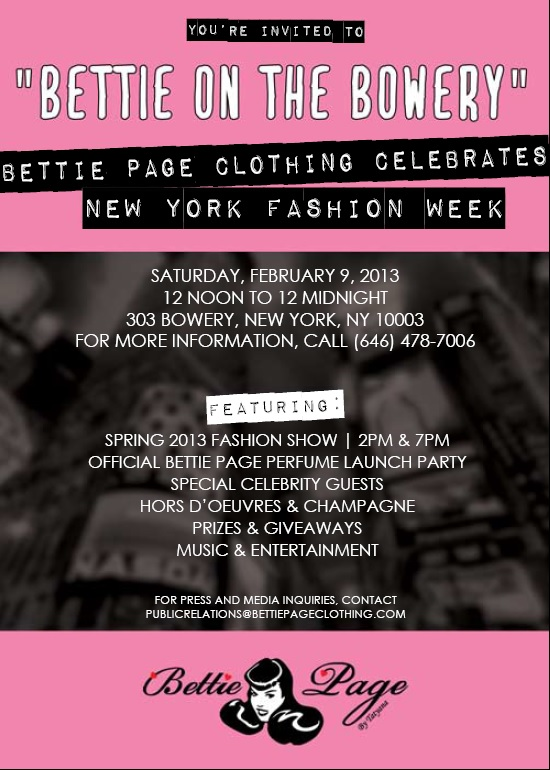 Bettie Page Clothing NYFW Event! To kick off New York Fashion Week, The new Bettie Page Clothing store in soho is having an amazing event to launch their new perfume and collection and you are ALL invited! There will be a runway show, prizes, celebrities, hors d’oevres, and music so aren’t you excited that you now have the perfect occasion to channel your inner 50’s pinup/sailor? If so, be there or be a square! Good times guarenteed! ← Bettie Page Clothing has landed in NY! Jasmine, thank you so much!! Everybody had such great suggestions and sincere compliments!